Professor Mark Whiteley writes an article for The Sunday Times, Style Magazine, on Sunday 28th July 2013, entitled ‘Keeping Up Appearances’ and features EVRF as being the latest treatment for the treatment of facial and leg veins. This week, the National Institue for Health and Care Excellence (NICE), issued its guidance for the treatment of Varicose Veins. In all cases now of symptomatic varicose veins the patient is to be referred in the first instance for Endothermal Ablation. Only if they are not suitable should foam sclerotherapy be considered. EVRF is increasingly recognised as a major player in the provision of endothermal ablation, extending the range of treatments in comparison with other such devices whilst offering significant cost savings. EVRF will soon be offered by medical clinics across the UK. FCare Systems NV launch their new proprietary needle designed specifically to be used to treat otherwise difficult to access Perforators. Details to follow. Dr.Attila Szabó MD, PhD of Semmelweis University Budapest, Hungary presents his latest study using the EVRF, entitled, “Endovenous Saphenous Ablation using EVRF Radiofrequency device and CR45i Catheter – 313 Cases”. His conclusion was that the EVRF saphenous ablation by using the CR45i catheter from F care systems is a safe, painless procedure for the treatment of the GSV and/or SSV – high patient acceptance and minimal postoperative discomfort allows the quick return to work and normal life. The procedure under local tumescent anesthesia is simple, the disposable devices are easy to use. In our practice the EVRF treatment with CR45i catheter was superior to conventional varicectomy or to laser ablation using a 810 nm diode laser with bare laser fibre”. Click here to see the full Study. Dr. Sarah Thomis from the UZ in Leuven presented the final results of a prospective trial which was conducted from September 2011 until May 2012. This presentation was given at the European Vascular Course in Maastricht on the 10th of March 2013. The prospective trial discussed in the presentation is a pilot study on the treatment of forty patients with Great Saphenous Veins reflux using the EVRF and the CR45i catheter. The results presented show EVRF is a safe and efficient treatment. Click here to watch her presentation. Modern Aesthetic Solutions Ltd are pleased to announce that they have been formally approved to be entered on to the NHS Suppliers Master Indemnity Register (MIA) enabling them to supply EVRF products to the National Health Service. Their unique reference code is IFA2007. FCare announce the introduction of their new HPR45i probes designed for and proven in the clinical treatment of Haemorrhoids. “This new and improved method is easy to use and very effective on Haemorrhoids degree 1 – 4. Treatments can be done over several 15-20 minute sessions under local anesthesia. Patients hardly experience any pain post treatment so minimal postoperative care is required and a swift return to normal daily activity is possible. Clinical trials with this revolutionary method have been conducted by Dr Kłos and Dr Batijewski in the Kriocentrum in Otwock, Poland, on 160 patients and have proven the effectiveness of the HPR45i probe. 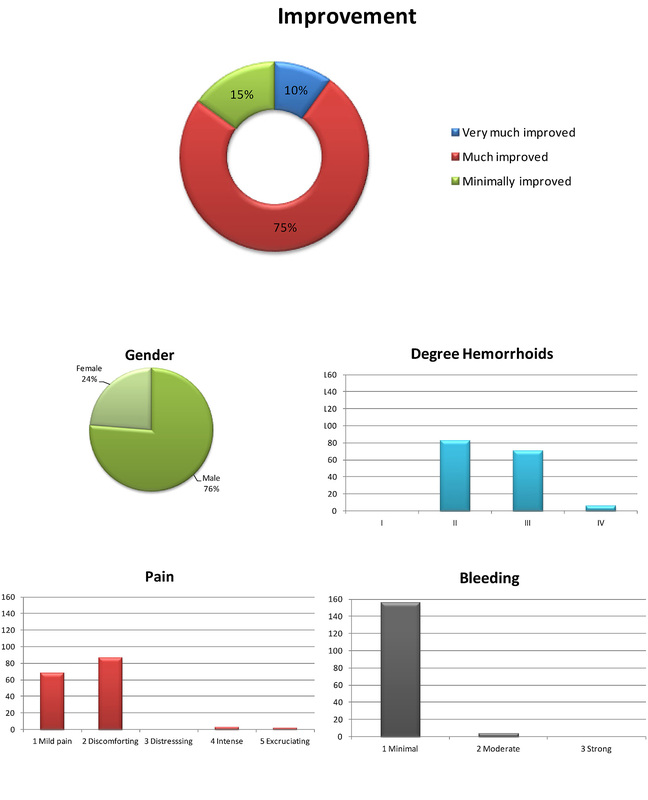 The average number of sessions was 2 – 3 with a 95% reduction of the treated hemorrhoids. Most patients were very satisfied with the treatment and their instant relief of pain. They were able to return to their normal activities within 24 hours after the treatment”. Whilst most vascular practitoners of the EVRF device might not conduct Haemorrhoid treatments, to have it available as yet another function of the device within a clinic or hospital facility simply adds to the value of the unit. Click here for initial study results. Dr Attila Szabó MD, PhD of the Semmelweis University Budapest, Hungary has recently completed a trial using the EVRF. Between July 2011 and September 2012 he treated 150 patients, recording 149 of those as having witnessed total occlusion of the Saphenous Vein. He concluded that the EVRF saphenous ablation is a safe, painless procedure for the treatment of the reflux of the GSV and/or SSV with high patient acceptance and minimal postoperative discomfort allows the quick return to work and normal life.